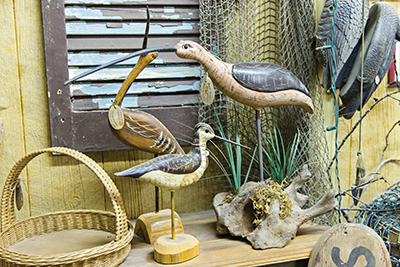 Richard Christy—the founder and master craftsman behind Buck Island Bay Decoys as well as the owner, chef, and proprietor of Rock-n-Creek Cabin—whittles away at a hunk of wood while discussing his artistry, life, and the ways in which the two overlap. Like shed feathers, the shavings fall to the sawdust-strewn floor. He covers his time as a White House chef, his stint as a rural paramedic, and his passion for and efforts to preserve dying art forms. During a punctuated pause, he holds to the light the rounded and tapered sculpture, unmistakably the form of a waterfowl, that only moments ago was merely a block of wood. Christy’s lifetime follows as all great stories do: events are at once surprising and inevitable. His voice bears the signature drawl of Virginia’s Tidewater region, and his humility in discussing his mastery of both cuisine and carving, and the transition bridging the two, calls to mind the laconic storytelling of a cowboy. He made a name for himself early on in his culinary career, first as a chef for President Gerald Ford (“He was a real foodie, like me.”), and later as the founder of the renowned Black Tie Catering. By then, the rigors and uncertainty of the restaurant industry had begun to set in. “Sixteen-hour days, six days a week, no holidays, no job security, no gold Rolex after thirty years … I needed a hobby outside of the kitchen.” One day in 1982, while sculpting an ice centerpiece for a banquet, he noticed his proclivity for carving and realized that he’d discovered an outlet for stress. “I thought, ‘If I can carve a watermelon into a flower, why not try to do it with wood?’ ” he says. Eager to explore this artistic inkling, he was reminded of his years as a young man spent in Sandbridge, an island a half-mile wide with the Atlantic on one side and the Back Bay, which tapers into the Currituck Sound, on the other. “It’s a desolate stretch of beach that runs down to the Outer Banks,” he says. “Living there I was surrounded by waterfowl and generations of decoy carvers.” One of those carvers was Charlie Seidel, a master decoy carver and instructor at the Virginia Aquarium & Marine Science Center. Christy enrolled in Seidel’s workshop and, in doing so, altered the trajectory of his life. At the workshop, Seidel imparted the advice of a seasoned guru: “Charlie took a block and told me, ‘Take away everything that doesn’t look like a duck.’ ” This sage advice from master craftsman echoes that of Michelangelo. When asked by an acquaintance how he was able to sculpt such beautiful, naturalistic angels, the Renaissance artist responded, “I saw the angel in the marble and carved until I set him free.” Although Christy, a Renaissance man in his own right, works with white cedar instead of marble, the great artist’s sentiment rings true. Before duck decoys garnered the acclaim as quintessential Americana folk art—with some models selling at auction for nearly one million dollars—the wooden sculptures served a pragmatic purpose. Waterfowl overhead possess an instinct for hunters lurking in the reeds or waiting in blinds. By floating a “gunning rig” of decoys, the hunters are able to subdue the fowls’ flighty instinct, convincing the birds that the body of water is safe as it is peacefully populated by what appear to be other birds. Once the live fowl pitch and set their wings, the hunters are able to take aim from a closer range. Christy exudes a reverence for the origins of the decoy and its application as a tool, not a decoration. 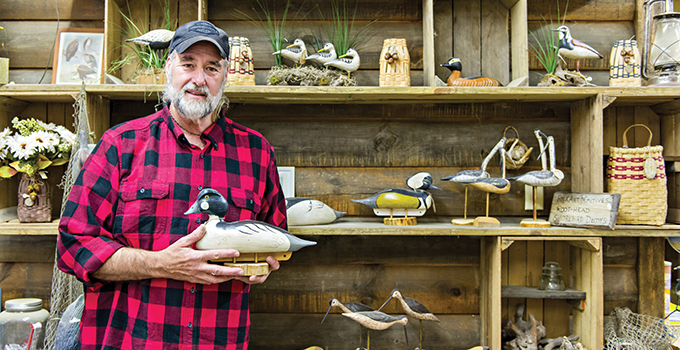 “I focus on the traditional side: why decoys were used in the first place. It goes back to poorer folks who would carve decoys out of broken masts and dunnage. They’d gather it up from the shore and chop birds out of it, then rub it with crushed glass wrapped in a rag to ‘sand’ it.” His respect for the history of the decoy is matched only by his admiration for the decoy carvers from whom he inherited the secrets of the craft, often begrudgingly at first. He walks me through his studio and shows me decoys in various states of completion. Driftwood, a white oak basket of sunbleached antlers, oyster shells, birdhouses, Swedish hatchets forged by hand. Sawdust hangs in the air, as does the silence, occasionally broken by the hacks of his axe. The form of a swan emerges from a slab of juniper; in its incompletion, the carving resembles a swan as seen through the haze of dawn. “Swans are flighty and aggressive; they don’t like others. 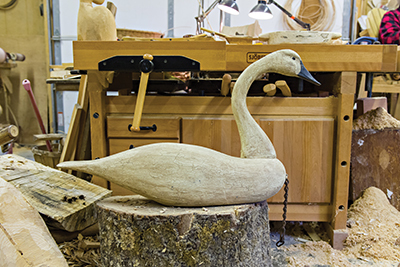 So when a bird in flight sees a swan, they’re reassured.” Aside from an electric band saw, the process of carving is done entirely by hand. The absence of power tools attests to the incredible potential of a simple knife or rasp when wielded by a veteran artist like Christy. At first, decoy carving was relegated to a hobby while Christy’s culinary career progressed. In 1994, Christy was designated a Certified Executive Chef, the second-highest honorific for American chefs. When he opened Squeeler’s Diner three years later, Christy’s dreams of running his own restaurant had come to fruition. Though he was at the pinnacle of his career, he sensed that he was already being undercut by the next generation of chefs—younger, trendier, less skilled but less costly. Christy was at a crossroads professionally, and so he decided to take an eight-month sabbatical to build a mountain home and meditate on the different paths and outcomes available to him. Don’t mistake Christy’s zen mindfulness for stagnancy though. 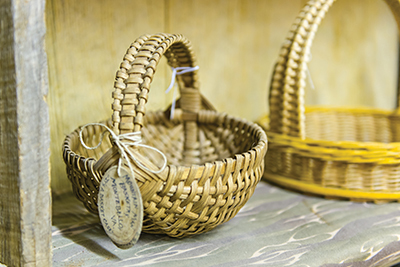 His curiosity in disappearing arts led him to basketry. “Our ancestors came here from the Old World with nothing, so they had to make things from the land,” Christy says. “Carving decoys had started to become routine, not to say I’d mastered it—I haven’t and if I had a second lifetime I still wouldn’t. But I wanted another lost art and I found Clyde Jenkins, one of the last white-oak basketmakers in the land.” Unlike a basketweaver, Christy wanted to be a basketmaker: starting from the beginning by felling white oaks from his land, cutting his own reeds, and riving every split, rib, and weaver from that tree. “To create a handmade white oak basket takes time, patience, knowledge, and strength,” he says. “When you are finished, you have created a working piece of tradition, an heirloom.” Christy didn’t stop there. His prowess with woodwork has seen him venture into treenware, teaspoons, and dough bowls, all hand-hewn with the immense care at the heart of anything Christy creates. Christy’s talents extend far beyond his cuisine and carvings. As the proprietor of 2,100-square-foot Rock-n-Creek Cabin, named for a nearby granite outcrop and the headwaters of the Tye River, he fosters a sense of tranquility, of communion with the surrounding landscape. Christy understands the recent trend of “glamping” (a portmanteau of “glamorous” and “camping”) and caters to guests who want massages and a rural Ritz Carlton experience. However, a more pastoral aura permeates the cabin. What Christy offers visitors is the serenity and quietude of the region. There are no cell phone towers nearby. No wireless internet. In place of these modern amenities is something permanent and ancient. “Out here the stars are so close that you can grab them,” he says as the sun starts its descent. “To be out here and experiencing that twilight …” His words trail off, their meaning understood regardless. Inside the cabin are rough exposed beams, quilts, porches, decoys, and a coffee table built from a refurbished lobster trap. The design is as luxurious as it is quaint. Perhaps this is the perfect illustration of what makes Christy fascinating and his work remarkable: the obvious talent without any of the pretension. Now it seems he has his aim set on mastering another dying art: relaxation, or rather, the pursuit of serenity while continuing to learn.